through the front window curtains. keeping her awake, to think. kissed her in a closet at the office Christmas party. A well imagined George Clooney would do in a pinch, too. to make an excuse why she isn’t sleeping. she just wants to feel something different. She doesn’t know what to wear. he didn’t say where they might go. it isn’t a special occasion, just a Friday in February. He is careful about how he spends his money. something that wasn’t always true. They will probably stay in town, go to the diner, have the fish fry special. even underthings, waiting for the right occasion to wear. She knew now, in her heart: I will never wear any of those things. Thomas Bonville has lived within two miles of the Hudson River all of his life. 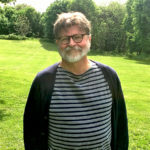 He regularly reads, writes and converses with the Rensselaerville Poets, as well as participates in open mics at 394 Main in Catskill and Pine Hollow in Slingerlands, NY.